This 8-page booklet measures 5.5″ X 8.5″ and is printed on 80# premium paper stock. The booklets are saddle stitched and printed in full color. The best practices for utilizing this tool are outlined in the Administrator's Handbook. The Coach’s Evaluation Tool is to be used by coaches who have completed the 3Dimensional Coaching Course for Certification and/or College Credit. By helping to assess each component of the 3D framework, this tool is designed to be both diagnostic and prescriptive in the evaluation process. 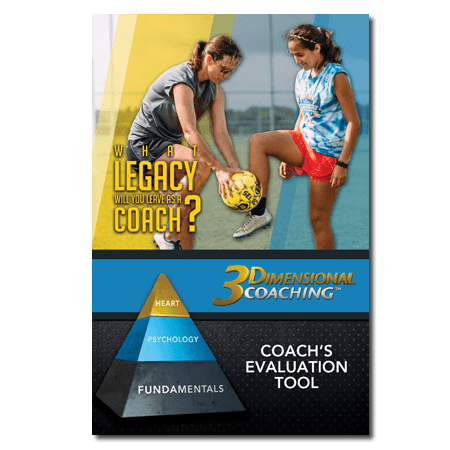 For administrators who have invested in training their coaches in 3D, The Coach’s Evaluation Tool plays an essential role in helping the 3D Coaching language to stick in the athletic program long-term. When coaches know that their pre-season and/or post-season evaluations will be based on the 3D Coaching framework, it holds them accountable and helps to establish the 3D language in a coaching community.